Hi, I'm Jay, and this is a Saddle Valve. It is a standard part with almost all small capacity humidifiers. 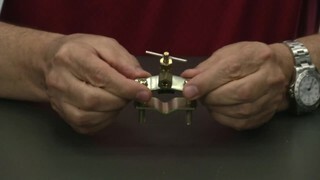 This valve supplies water to the humidifier, and acts as a shut off when you want to perform maintenance or shut down the humidifier for the summer. It is self pearcing, and straps on to copper pipes between half inch, and one and a quarter inch in diameter. It should be replaced if it is leaking, won't open, or is damaged. Here are the parts that are standard with most saddle valve kits. the brass insert and nylon ferrules are only used when you're connecting plastic tubing to your humidifier. This is a brass ferrule, which used for copper tubing connections, brass nut, screws, saddles, gasket, and the valve. Replacement is easy, here's how. I like to wrap Teflon tape around the edge. So we're going to get a couple of wraps around here. Here we go. Now we're going to screw this on to the saddle. Now, if you are replacing an existing saddle valve, yo're going to want to turn the stem all the way in, so the needle is exposed. This will allow you to insert the needle into an existing hole in the main line. Now you're going to want to take the gasket, just like that, and place it onto the valve. Now it's ready to be installed. Now we're going to install the valve on the main line. We're going to take the needle, and insert it into the existing hole that we already have. Line up the saddle, install both screws, turn the screws until it's snug. Now we're ready to attach the pipe. Slide the brass nut on first, followed by the ferrule. Now, if you already have existing copper tuning with the nut and the ferrule on it, there is no need to cut the end off. But if you don't have that, this is how that goes together. We're going to slide this ferrule on here, at least an inch. Insert the copper tuning into the valve. Slide the ferrule forward, and the nut forward, as we begin to tighten it. It's important that you keep pressure on the copper tubing, pushing it into the valve. Because often times, when you tighten the nut, it wants to push the copper tubing right out of the valve. Now you're going to get your wrenches out, and tighten this. If you have a plastic hose going to your humidifier, take the brass nut, install it first, then the nylon ferrule, you'll notice that theres a pointy side and a dull side, the pointy side goes towards the valve. We'll slide this onto the tube, install the insert, insert it into the valve. i'm putting pressure on the hose to keep it installed into the valve. Now we're going to get the wrenches out, and make it snug. The assembly is now complete. Thank you for watching. For this and other products, visit us at AirQualityParts.com.